The dramatic and horrific images of the attack on the World Trade Center in New York on September 11th 2001 are forever etched in the minds of anyone who witnessed those events either in person or on television. The scale, method, and nature of the attack, and the loss of life was, and still is, traumatic for so many. Apart from the image of the hijacked airliners striking the twin towers of the WTC, the other image that stays in the mind is of the collapse of the vast towers in a shower of dust and smoke, pulverising those who never had a chance to escape, including many members of the New York emergency service. . Without wishing to trivialize New York’s trauma, it’s worth pointing out that Midleton, yes, little Midleton, woke up to the aftermath of its own version of ‘9/11’……a century earlier. Thankfully there was no loss of life. The storm that burst over Midleton in September 1903 was reported in The Cork Examiner newspaper on Friday, September 11th, 1903. One of the most violent storms experienced within the memory of the oldest inhabitant swept over Midleton and district this evening. It commenced at about 4 o’clock, and increased with such severity that about an hour after it assumed the character, the wind blowing from the north-west. Pedestrianism in the streets was almost a matter of impossibility, and vehicular traffic was for the time suspended. Some of the strongest trees were torn up from their roots, and the public roads were rendered in numerous parts of the district actually impassable. A large part of the public road near Killeagh was blocked with trees, and the mail car from Youghal to Midleton had, in consequence, to come another route, via Mogeely. Telegraphic communication was suspended own to the fact that the wire got broken or twisted by the force of the gale, and the falling on them of heavy trees, and though a good effort was made to repair the damage, the work was abortive, with the result that communication with Cork, Dublin and London, was out of the question. The intensity of the storm might be realised from the fact that about six feet of the finely formed steeple of the Protestant church at Midleton was swept on to the roof of the church and penetrated it to the interior., the gap in the roof being plainly visible from outside the windows. Some men who were working inside had a narrow escape. One of the graves was torn up, portion of the coffin in it being visible. The roofs of houses were in many instances broken. Some sheds were altogether unroofed, including one at Bailick and Midleton, and along the streets are scattered slates and other debris, hurled from the housetops. All kinds of agricultural work had to be suspended, very serious damage having been done to the corn crop not yet cut down. ‘Pedestrianism’ – now there’s a new word to enjoy! A number of points are clear from the account. First, it wasn’t just Midleton that suffered – even as far as Killeagh there was damage. Much of this was the disruption of the telegraph system. This posed a danger to the railway service linking Cork to Youghal via Midleton, because the signalmen and stations at Carrigtwohill , Midleton, Mogeely, Killeagh and Youghal couldn’t issue hazard warnings ahead. 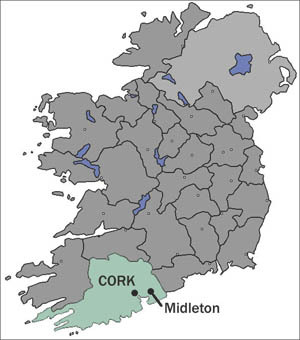 Furthermore the Royal Irish Constabulary at Midleton, Castlemartyr, Killeagh and Youghal were unable to send or receive reports. The mail car was either an early motor van or horse-drawn van and it had to be diverted from Killeagh to Mogeely around Ballyquirke townland to get to Castlemartyr and Midleton. Shades of the flooding that cut the present N25 (also called Euroroute 1) linking Castlemartyr to Killeagh winter of 2015/2016. On that occasion the heavy traffic also had to be diverted onto the narrow road linking Mogeely and Killeagh to allow trucks to continue to Rosslare ferry port. One blessing was that Midleton and the surrounding villages didn’t have any electricity at the time, and only Midleton and Ballinacurra had coal gas laid on. The second point is that the storm actually began about 4.00 pm on Thursday 10th September, just before people went home for their supper. No doubt people fled the open streets and took shelter when the storm struck, but flying slates (also experienced in Midelton in 2009/10 and in 2010/11) are deadly to exposed pedestrians and to window glass! The loss of the tip of the spire of St John the Baptist’s Church in Midleton must have been a real surprise. This was the only spire in Midleton at the time since the much larger spire of Holy Rosary Church had yet to be constructed. The spire of St John’s had stood since 1825 but it seems that the slender tip of Richard Pain’s elegant design, made of solid stone, may have required some internal metal reinforcement by then. Midleton has faced many a fierce gale since 1903 but never again has the repaired spire of St John the Baptist’s Church fallen. The repair was clearly well done at the time. Seemingly unchanged, but actually the spire was repaired without any outward alteration after the storm of 1903. Finally, the anxiety about the corn crop (that is wheat and barley, not maize) was understandable. The Midleton distillery consumed a lot of the local barley, as did JH Bennett’s malting company in Ballinacurra (they supplied the malt for the Guinness brewery in St James’s Gate, Dublin). In addition, the Hallinan family’s Avoncore Mills on Mill road was another major consumer of the local grain crop. These three firms were also big local employers, hence the anxiety about the corn. The Cork Examiner of Saturday, 12th September 1903, also reported on the damage caused by the same storm over much of Ireland and the United Kingdom. So Midleton didn’t suffer alone. That year saw ten hurricanes sweep into the West Indies and the south-eastern United States, five of them in September alone, however the ‘hurricane that struck Midleton, Ireland and Great Britain wasn’t actually a true hurricane. Furthermore a very severe storm had struck in February of that year, although Midleton seems to have got off lightly on that occasion. One wonders if that storm had weakened the spire that fell in September. There is one memorial to the storm of 1903 in Midleton – the undamaged stone that had fallen from the church spire was later recycled as the pedestal of a sundial erected in St John the Baptist’s churchyard, just metres from where it fell. It was erected after 1923 inemory of Henry Penrose-Fitzgerald, of the Grange, Midleton and agent to Lord Midleton. One final thing to note. ‘Pedestrianism’ – a new word to enjoy!